Harris Corporation has announced that it will offer an all-digital navigation payload for GPS Block III space vehicles (SV) 11 and beyond. The Melbourne, Florida–based company acquired the GPS navigation payload technology last year as part of its acquisition of Exelis Inc., which previously had acquired the payload business from long-time GPS program supplier ITT Industries. ITT/Exelis/Harris navigation payloads have been on all of the 80-plus U.S. GPS satellites launched since the 1970s — with more than 750 years of on-orbit life without a payload-related failure, according to Harris. Harris’ fully digital navigation payload will enable on-orbit reprogramming of GPS signals and transmissions, according to the company. The all-digital payload expands on the advanced features of the current 70-percent digital solution Harris provides for Lockheed Martin’s GPS III SVs 1-8. The features include an advanced modular design, atomic clock timing systems, radiation-hardened computers, and powerful transmitters. 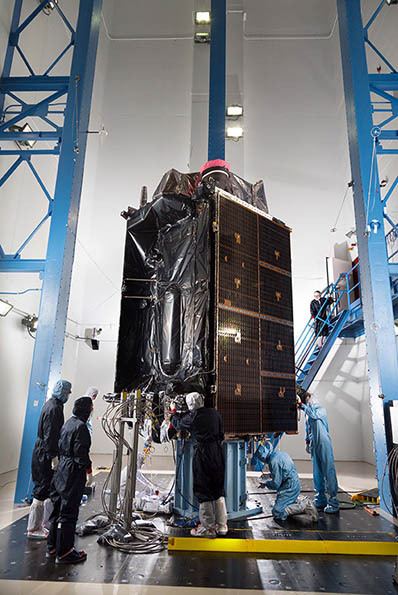 ITT and Exelis encountered technical difficulties in developing the most recent version of the GPS III navigation payload, which has substantially delayed launch of the first satellite in the new generation of spacecraft. The new payload combines innovative digital capabilities developed by Harris and Exelis, now a part of Harris. In 2013, Exelis successfully demonstrated digital navigation signal capability in a formal preliminary design review conducted by the U.S. Air Force, Harris representatives said. The payload also leverages the mature Technology Readiness Level 9 legacy Harris reconfigurable payload that is flying on the International Space Station and is incorporated on hosted payloads for the Iridium NEXT satellite. Harris has more than 500 digital processors on-orbit and another 150 awaiting launch.